The aim of the project is to define and compare the most useful supportive techniques for language learning, used in work with adults. The first step will attempt to find games and simulations (virtual and real), which could be useful in language teaching. The partners of the project will arrange experiments, which will examine the effectiveness of games/ simulations in different organizational cultures. The final result will be a book about the project and experimental research. 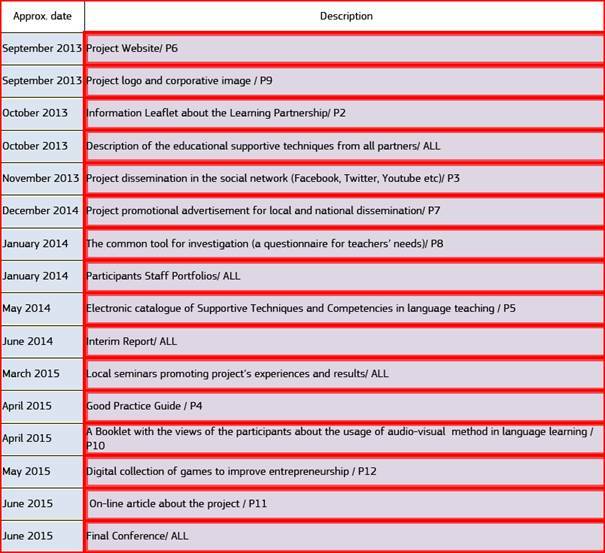 By this project twelve European institutions will try to modify the way teachers teach languages in order to make topics more attractive for adult learners by using inexpensive and accessible tools. Therefore, the project will be focused on 2 connected areas of interest: finding games and simulations useful in language teaching (GAMES AND SIMULATION) and using ICT devices as supportive learning tools (TOOLS). Our project will join the different educational competences and the personal teaching strategies in the mobility of adult learning staff. The partnership also will strive to develop a platform to further build bridges between training institutions and other providers of education, to compare and lead the way to integrate good examples into the process. The results of this partnership will be shared through the organization of a seminar for adult teachers and trainers. The final product, a compilation of results, will be published on the project website. The project website will exist after the end of this Learning Partnership, and then it will not only be used to present this Learning Partnership, but also to inform about the ongoing future cooperation between the partner organizations. Feedback from learner Claudine T.
Feedback from learner Ann F.
The seminars and workshops will be the basic method of work in the project. The effective cooperation and communication will mainly be held using a common project web site with forum option, blogs, e-mails, fax. The cooperation during the project will be supported by meetings in project partners institutions, which are usually better for stimulation of activities and exchanging ideas. This partnership was build upon contacts and partnerships in previous and present European projects between the participant organizations. The contacts and communication in the preparatory phase were easy and fluent using e-mail, to gather all information and contribute to the design and the writing of this proposal. All partners had the opportunity to pronounce themselves about the content and give their contributions. We intend to continue using a participative methodology during the project in order to ensure an effective cooperation, communication and involvement of all partners and participants. This methodology is based on previous needs analysis and expectations, elaboration of draft proposal by coordination, debate and integration of partners contributions, monitoring, adjusting and final evaluation. To achieve this, in the 1st partner encounter, the communication system and networking tools will be established. This activity will be led by a project coordinator; partners will be asked about their habits and online distance working methods and tools, and also about their expectations and suggestions. With this information, the coordinator will draft a communication system, suggest the networking/collaborative tools and establish a plan for their use; this draft will be discussed and the partnership will make an agreement. In subsequent partners encounters, this agreement will be monitored and any necessary adjustments introduced and there will be a final evaluation. 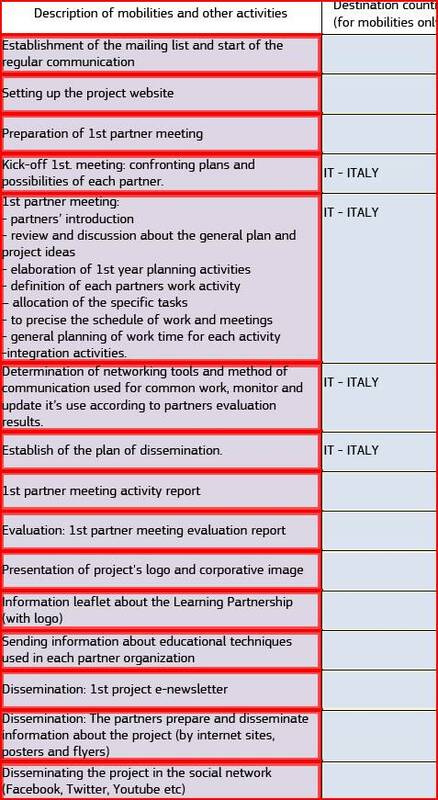 We would like to highlight that the activity plan (with partners responsibilities, distribution of tasks and results to achieve) and also the partner encounters calendar will contribute to the cooperation and communication efficacy process, because all partners have agreed to them and know what and when is expected to be done/ happen/ be achieved. The communication system and network tools will be based on a collaborative, open source and free web systems, such as e-mail, google documents, groups, skype, msn, blogger, flickr, Youtube, Facebook. At the beginning of the project we will launch a project website for the publication of news about the project. Formal documents (e.g. : meeting and workshop agendas, newsletters and all deliverables), and reports (partner encounters activities and evaluation reports), will be elaborated by the responsible partner and validated by the partnership; they will have a digital/online version and paper one and will be distributed to partners. One of the main principles that rules this project is, along with partnership cooperation, a participative methodology to engage all partner's staff in all steps of the project. As the objectives, strategic steps, activities and results are already defined, all member staff will always participate in planning, executing and monitoring of the activity plan execution and results/deliverables attendance. Tasks are already assigned and calendar established, so most important is to define how to implement activities and obtain results. To do so, all staff will be involved and motivated to participate; in each partner encounter there will always be a time to have a formal project meeting, to deal with planning, execution and monitoring issues. For every partner activity and responsibility it is foreseen to always start with a needs analysis and expectations identification, establishment of a draft plan, discussion and integration of partners contributions, design and validation of final version, continuous monitoring in all partners meetings, introduction of necessary adjustments and final evaluation at the project’s end. This way, all partner staff will have a real opportunity to contribute to project implementation, monitoring and evaluation. All management issues and all major decisions to be taken will be decided by consensus between all partners, during the partners meetings. After each meeting there will be an activity report, validated by all partners that will be used as a planning and monitoring instrument and also verification and description of results/deliverables attendance. We would also like to highlight that at the inaugural project meeting there will be an extended time devoted to promoting institutional and personal relationships ;in this way, we expect to strengthen bonds, trust and understanding between each other, which surely contributes towards better personal and institutional relationships. Bearing this in mind, we also intend to include cultural and social activities in all partners encounters, reinforcing these relationships in more informal ways. Other very important principles that will rule this project will be respect for cultural diversity between partner institutions and staff, so issues like tolerance, mutual respect and understanding will have a strong relevance in the way the project will be developed. In our Partnership public educational providers are represented (University of Seville, University of Venice, University of Almeria, University of Helsinki) and NGO organization in the field of research, training and guidance of adults (AYELD, M- CUBE, Ala Nun'Álvares), here called “private sector providers”. Will join us and support the community-based organizations (University of The Third Age, NAZİLLİ HALK EĞİTİMİ MERKEZİ VE AKSAM SANAT OKULU) and representatives of the SME sector (BAIBUK TECHNOLOGIES IRELAND, LTD, Hackl & Kienel-Mayer OG, Language Link). Education providers represent key stakeholders in the process of adult education. They are the basic key solution for the necessity to provide further education in response to existing demand. It is essential that they base and adapt their educational offers to the needs of learners. They also have to convince adult learners to participate in their programs in order to achieve a return on their investments. Moreover, both public and private sector providers of learning and training services bring a wealth of experience of direct interaction with learners and potential learners. They will share their experiences in reaching and interacting with other stakeholders: our partnerships with other education facilities as well as key players in the field will therefore enable them to facilitate the exchange of adult learning teaching staff, course content and best practice. Non-profit organizations in the education sector are the organizations participating/ belonging to wider EU project networks cooperating with other institutions to improve teaching quality, encourage exchange of staff and know-how, and implement different scale and scope projects for direct or indirect adult learners’ engagement (eg. through inter-generational learning), the same as the community-based organizations. Partnerships with NGOs and businesses will provide course developers with feedback regarding current skills demand and possible work experience placements. In this project, we will explore much further all the possibilities offered by games and related digital technologies as a stimulus to learning and communication. Close attention will be given to partnership processes and outcomes throughout the project lifespan. Formative evaluation will be important to examine the process, identify key learning points and improve the cooperation and performance of the partners. It will be done through a mid-term review using a questionnaire administered in a project meeting or via email and focusing on such aspects as: organizational learning in the partnership; involvement in partnership activities; and sharing and exchange practices. Normative evaluation will be crucial to assess the partnership outputs using as references the project objectives and the criteria set by the European Commission, most likely considering aspects such as relevance, effectiveness, efficiency, impact and sustainability. It will be implemented using a focus group approach and a questionnaire sent out to all partners and focusing on such aspects like: organizational matters (planning and management, partnership composition, commitment and involvement, leadership, cooperation and communication, etc. ); processes and methods (working methods, innovation, dissemination procedures, etc. ); outputs and products (tools, training activities, dissemination events, etc. ); valorisation and sustainability (new projects/funding, network visibility and impact on stakeholders and users, transferability, stability of relationships, etc.). The evaluation efforts will be coordinated and facilitated by one of the partners. A dissemination plan will be established at the inaugural meeting within the first partner encounter. A participative methodology will also be used to establish this plan, starting by analyzing partners needs and expectations, establishment of a draft plan, discussion and integration of partners contributions, design and validation of final version, continuous monitoring, introduction of adjustments and final evaluation, at the end of the project. This plan will define: types of results to disseminate, their support (paper, digital), form (leaflet, presentation, photo album, video, newsletter, report, blog, etc. ), targets for each one (who will receive the results), means of communication (in events, by e-mail, by post, on line access), and calendar (when and how many times/periodicity). Every partner will use their personal contact data base in each country and also search for other adequate dissemination targets in their country or other countries. 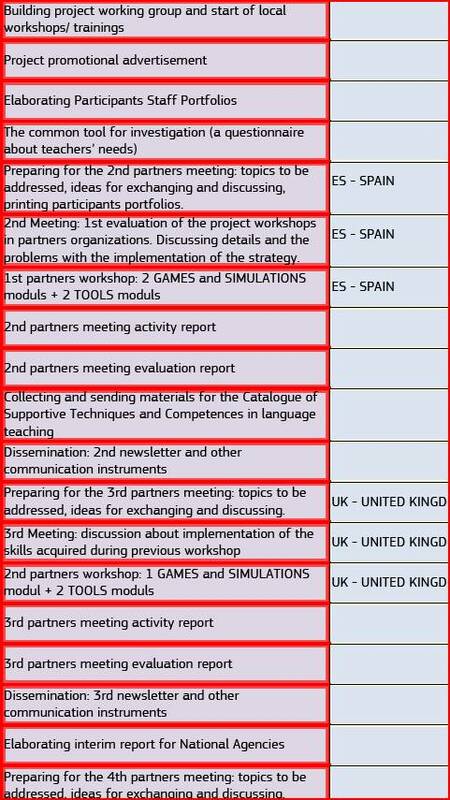 It is already envisaged to have 6 partners encounters, based on pre-accepted general objectives; after each we will produce: an activity encounter report, an evaluation report and a newsletter; the reports will be distributed among partners and newsletters will be disseminated to each partners contacts, according to the dissemination plan. 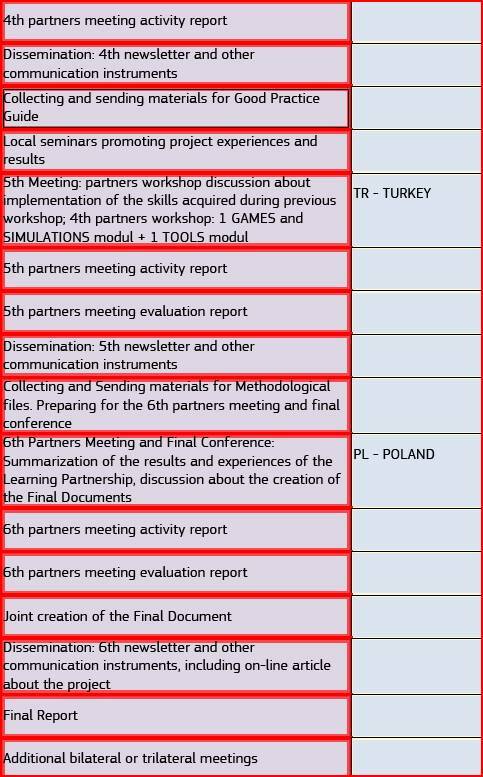 For each partner encounter there is a pre-defined plan related with project activity plan, including some already defined outreach activities, such as organizing workshops (with participation of invited experts, students, trainers, consultants) and dissemination tools such as newsletters. Project results will be disseminated in accordance with the established diffusion plan, using tools such as blog, YouTube and others. We would like to stress that we will have a environmental attitude, always preferring dissemination supports and means that will consume less energy and resources; for that on line web versions, e-mail and digital versions will be preferred whenever it is shown to be more adequate. ICT collaborative tools and supports will give a strong contribution in this objective. We will create a final document for the Learning Partnership, in which the association and its activities and results will be described in detail. In addition, a prospectus will be created with important information about this Learning Partnership. Besides, we will create an option to download the final document and the information leaflet from the website of the project.